Is it just me or does the month of December come at you like a freight train? I find a lot of pressure this month that comes in the form of get togethers’, visits, holiday parties, etc. This is by no means a complaint – it just adds a bit of intensity to the month. That being said, I LOVE December. Both of my parents were born in December as was my maternal Grandmother. I have beautiful friends who celebrate their birthday this month as well. It is a month of getting together and counting our blessings. It really is a month to celebrate and I am down with that! Now, what goes well with celebrating? Hmmmm – sparkling wine! Yes! This Brut is a pale lemon colour with continuous bubbles. On the nose, there was an abundance of red apple and a hint of baked bread. I found it had a mild intensity and nothing really pronounced. On the palate, I tasted more red apple and some citrus notes. 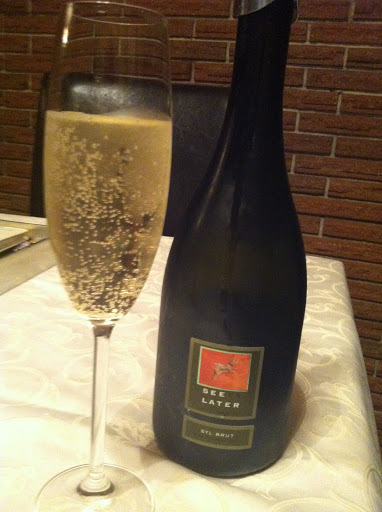 The SYL Brut is easy to drink but it is not complex or really even that interesting. The rock bank theme for this sparkling category has confused me with this bottle. I think it would be the opening acts’ back up singer. It just is not a show stealer. This wine certainly is not bad or unpalatable in any way, shape, or form. It just doesn’t really rock my world in a way that I had hoped it would. It is a bit simple and I wish it was able to deliver more of a punch so it goes into the “If you are in the mood” category. It is good but not very good or great. On a personal note – I want to give a shout out to my classmates as we have all completed our Level 2 WSET exam. Thank you all for making the last 3 months a fantastic journey! The social hour with a wine and cheese ‘after party’ was indeed wonderful. Our instructor, Iain Philip’s quote of the evening was “Wine is the new golf.” Love it!